SOLID-STATE VOICE RECORDER DUE IN JULY: Norris Communications, Poway, Cal., said it plans July delivery of Flashback, personal voice recorder that uses flash-memory module instead of tape. It also plans mockups later this year of versions that will play back and record digital music. Recorder, which will list for $199, looks like computer mouse that has been stepped on and accommodates SoundClip solid-state modules about size of 50¢ coin. Mockup of SoundClip we were shown had Intel logo pasted on . Pres. Elwood Norris said first SoundClip modules will have capacity of 30 min. and will list for $69. Additional SoundClips for 60- and 120-min. capacity will be available later at undetermined prices. Company said it will produce Flashback at its affiliated American Surface Mounted Devices factory in Cal., and is aiming for sales of 150,000 units in first 12 months after introduction. Norris said company is in talks with unnamed "billion-dollar" vendor to which it would supply stepup Flashback product with LCD readout not found on first-generation model we were shown. Company also plans to show "lab prototypes" by year-end of Flashback version capable of recording 75 min. 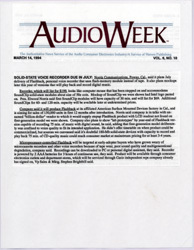 of music with digital sound, he said, adding that first-generation model deliberately was confined to voice quality to fit its intended application. He didn't offer timetable on when product could be commercialized, but sources we canvassed said it's doubtful 180-MB solid-state devices with capacity to record and play back 75 min. of CD-quality music could reach consumer market at mainstream pricing for at least 3-4 years. Microprocessor-controlled Flashback will be targeted at early-adopter buyers who have grown weary of microcassette recorders and other voice recorders because of tape wear, poor sound quality and multigenerational degradation, company said. Recordings can be downloaded to PC or personal digital assistant, they said. Recorder is powered by 2 AAA batteries for 3 hours of continuous use, they said. Product will be available through consumer electronics outlets and department stores, which will be serviced through Casio independent reps company already has signed on, Vp Sales & Mktg. Stephen Brightbill said.